Fiction – paperback; Allen & Unwin; 352 pages; 2018. Even at twelve Olive had known that others thought her family odd. Those Lovelocks, people would say, their looks loaded with meaning. They said it in the butcher, the supermarket and the haberdashery. They said it in the milk bar and in the playground at school. So begins Jenny Ackland’s Little Gods, an evocative coming of age story set in Victoria’s mallee region during the 1980s. Told in the third person but largely from Olive’s perspective, we are introduced to that “odd” family: Audra and Rue, two “prickly” sisters from the pioneering Nash family who married two sheep-farming brothers, William and Bruce Lovelock. An older Nash sister, the impossibly named Thistle, never married; and a third Lovelock brother, the not-well-liked Cleg, escaped the farm for life as a lawyer in the city, but returns home occasionally towing a rundown caravan with him. Olive lives in a small rural town with her parents, Audra and Bruce. On the edge of that town lies the sheep farm where Rue and William live with their three children — Sebastian, Archie and Mandy — and the tiny-bit kooky Thistle. The two families are close and Olive spends a lot of time on the farm with her cousins, climbing trees, riding bikes, swimming in the dam and playing with a tame raven called Grace (hence the image on the cover of the book). She also hangs out with Thistle, who is troubled — for reasons that become clear later in the book — but good fun, one of those rare adults who doesn’t treat her like a baby. Thistle is the key to the story, for when Olive discovers a photograph of a red-headed baby whom she doesn’t recognise it is her Aunt who reveals the child’s identity when everyone else refuses to engage. This sets into motion a chain of events that will have tragic repercussions on the entire family. From the start we learn that Olive, “caught in the savage act of growing up”, is headstrong, intrepid and occasionally cruel. She’s the ringleader in almost every activity she participates in, whether on the farm with her cousins, or in town with her best friend, Peter, the son of the local policeman. She has absolutely no fear of the town’s bullies, the thug-like Sand brothers, and often stands up to them even though they are much older than herself. It’s this fierce attitude and a desperate need to figure things out for herself that lands her in trouble. She might only be 12 but Olive thinks she knows best. When she discovers the baby in the photograph is her younger sister who drowned, she’s convinced that the adults in her family are hiding things from her, that “she was at the middle of something, so close to the nucleus she could almost touch it with her tongue”. That “nucleus”, she decides, is murder, and so she plans to find out the culprit and then plots ways to extract her revenge. I’ll admit that I did not expect to much like this story. Coming-of-age tales and family secrets just don’t do it for me anymore, probably because I’ve just read far too many of them. But I was pleasantly surprised by Little Gods — the title comes from the idea that people are little gods who have power to do things — because it’s told in a refreshingly honest way. It moves along at an unhurried pace, giving the narrative time to breathe, and the characters, all wonderfully colourful and distinctive (except, perhaps, for the men, who are merely shadows in the background), come to life through snappy dialogue, which includes everything from petty arguments to gossip and back again. Olive is a revelation. She’s a quintessential rural Australian girl, a wonderful mix of toughness and curiosity. And I loved the “atmosphere” of the novel, a kind of Australian gothic, not dissimilar to Donna Tartt’s The Little Friend. It’s the kind of book you can settle down with for an entire day and get immediately lost in the richly vivid world that Ackland has created. But don’t just take my word for it. 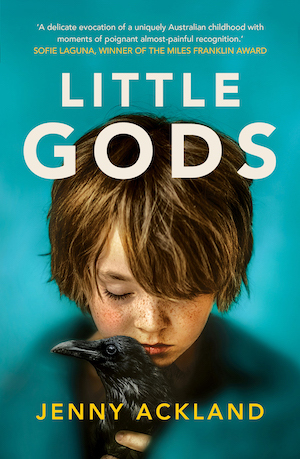 Little Gods has been shortlisted for this year’s Stella Prize and has been positively reviewed at ANZLitLovers and Whispering Gums. This is my 3rd book for #AWW2019 and my 2nd for the 2019 Stella Prize shortlist. Sadly, it doesn’t appear to have been published outside of Australia. I bought my copy when I was in Western Australia last month. Thanks for the mention… it prompted me to revisit my review and be impressed again by that pitch-perfect description of the child nursing the raven that I quoted at the beginning of the review. And yes, this one cut through the coming-of-age/secrets things for me too. It’s funny really… I mean, Rebecca is a coming-of-age and secrets novel too, and I could read that ten times over and not get tired of it. But today’s endless blurbs about family secrets just set my teeth on edge. I think the problem is that when you read so many books you identify the tropes / get sick of reading about the same kind of issues over and over again, and then when someone does it differently or uses an distinctive voice it captures your attention. I think Ackland really captures what it is like to be 12 years old and fiesty and independent. I like that she didn’t make Olive a little angel. I think that’s what was different about this coming-of-age story, actually, and perhaps that’s why I liked it so much because usually these girls are written as if they are delicate little snowflakes that are soft and pretty — and Olive is nothing of the sort! I’m sure you’ll love it when you eventually get around to reading it, ShelleyRae. It’s such a great adventure-filled and spirited story!